Andrew Biggs of the American Enterprise Institute claims there is no retirement crisis in the United States. Citing a recent report showing that senior incomes are high relative to other countries in the Organisation for Economic Co-operation and Development (OECD), Biggs downplays the fact that many American seniors are not retired: 30 percent of 65- to 69-year-olds in the United States are employed, versus 20 percent in OECD countries on average. 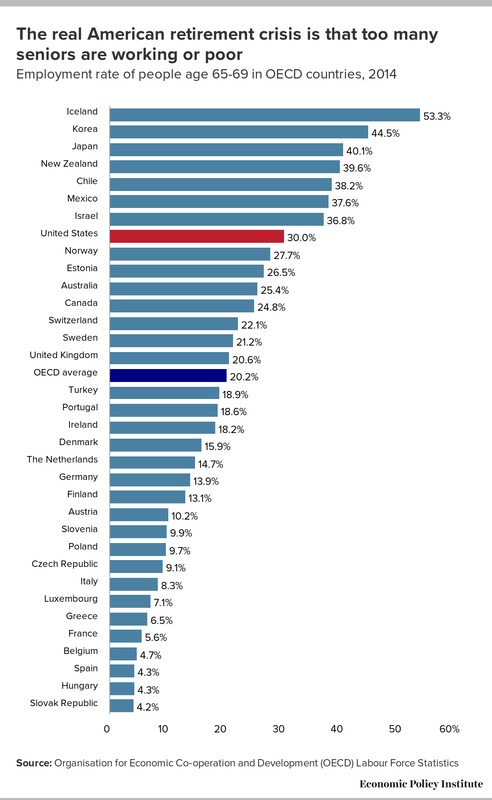 This ranks the United States eighth among 35 OECD countries in the share of 65- to 69-year-olds who are employed.